The U.S. Judicial Conference has approved proposed FRCP Rule 37(e). The rule now goes to the U.S. Supreme Court. If the Court approves the changes before May 1, 2015, and Congress leaves the proposed amendments untouched, the amendment will become effective December 1, 2015. The proposed rule presents a uniform process and standard which will resolve the split among the circuits on the availability of the most serious ESI spoliation sanctions. Proposed Rule 37(e) will replace entirely the current subpart, and, as stated in the Committee Note, “forecloses reliance on inherent authority or state law to determine when certain [curative or sanctioning] measures should be used.” The new standard will permit the most serious sanctions only when there is proof of “intent to deprive” the harmed party of the use of the ESI in its case. This blog post outlines the workings of the proposed rule. Given the complexity of the challenge, the rule is surprisingly simple. First, rather than generally dealing with lost evidence, the proposed rule addresses only lost ESI and applies only if a 3-part test is met. Second, if there is a finding of prejudice because the ESI has been lost, then a court may impose remedies to cure the prejudice, but no more. And third, the most serious remedies (including case dismissal and giving an adverse inference jury instruction) may only be utilized after a finding of “intent to deprive” the use of the lost ESI. 1. When Does the Rule Apply? The 3-Part Test. Committee Note: Many Court decisions hold that potential litigants have a duty to preserve relevant information when litigation is reasonably foreseeable. Rule 37(e) is based on this common-law duty; it does not attempt to create a new duty to preserve. The rule does not apply when information is lost before a duty to preserve arises. The Committee Note also recognizes that the party’s sophistication should be considered when a court analyzes whether a party realized what should have been preserved. Committee Note: Rule 37(e) directs that the initial focus should be on whether the lost information can be restored or replaced through additional discovery…If the information is restored or replaced, no further measures should be taken. In many ESI cases, this third part will end the inquiry. ESI that may appear to be lost can often be located elsewhere. Before a court explores prejudice and searches for appropriate remedies, it must consider the possibility that seemingly-lost ESI can be restored or replaced. 2. If there is a Finding of Prejudice, what may a Court Order? Under the proposed rule, only when the 3-part test above is met does a court continue with its analysis. 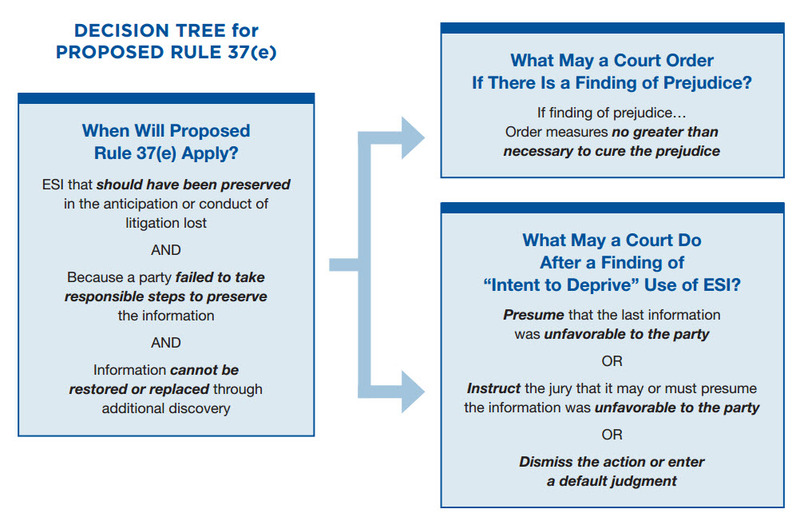 The question in subpart (e)(1) of proposed Rule 37(e) is whether there is a “finding of prejudice.” If so, then a court may reach into its bag of remedies, but is limited to “order[ing] measures no greater than necessary to cure the prejudice.” The remedies available at this stage do not include the most serious sanctions –the adverse inference jury instruction or dismissal. Those sanctions may be imposed only under subpart (e)(2). The Committee Note emphasizes that the proposed rule is purposefully vague on which party has the burden of proving or disproving prejudice. Committee Note: The rule does not place a burden of proving or disproving prejudice on one party or the other. Committee Note: The rule leaves judges with discretion to determine how best to assess prejudice in particular cases. 3. A Court may Order the Most Serious Remedies only after a Finding of “Intent to Deprive” the Use of the ESI. The center of the ongoing debate has been the required showing before a court may order the most serious remedies: an adverse inference jury instruction, dismissal of claims, or a default judgment. Some courts have required proof of black-hearted destruction of ESI, while the Second Circuit has authorized giving an adverse inference instruction based on a mere finding of negligence or gross negligence. The rule-makers intend a uniform national standard, and they reject the Second Circuit’s approach. Committee Note: It is designed to provide a uniform standard in federal court for the use of these serious measures when addressing failure to preserve electronically stored information. It rejects cases such as Residential Funding Corp. v. DeGeorge Financial Corp., 306 F.3d 99 (2d Cir. 2002), that authorize the giving of adverse-inference instructions on a finding of negligence or gross negligence. Committee Note: Subdivision (e)(2) limits the ability of courts to draw adverse inferences based on the loss of information in these circumstances, permitting them only when a court finds that the information was lost with the intent to prevent its use in litigation. Only if this hurdle is cleared does the door open to the serious sanctions. In conclusion, the proposed amendments to Fed. R. Civ. P. 37(e) are intended to apply a uniform standard in federal courts regarding a party’s obligation to preserve ESI and the remedies available to the court when ESI is lost. The remedies are intended to be remedial, rather than punitive, and the most serious remedies are reserved to instances where dark-hearted intent is shown.